On 8 March 1965, some 3,500 US Marines, the first US combat troops to arrive in Vietnam, landed in Da Nang to defend the US air base there. On 8 June, following further reinforcements, General Westmoreland authorized his troops to begin 'offensive patrolling'. 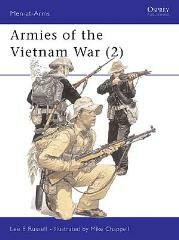 Lee Russell's follow-up to Men-at-Arms 104 focuses in finer detail on the uniforms and insignia of the US Army and Marines, the ARVN and the NVA. The book is packed with superbly detailed black and white photographs of the forces in the field, and Mike Chappell's excellent illustrations provide key reference material for the contemporary uniforms and battledress.